The words of the unchained slaves. These events provided new momentum for the creation of a Ukrainian army. The Ukrainian government and the General Secretariat were formed soon afterwards, and the position of Secretary General (minister) for Military Affairs was introduced. Symon Petliura, who earlier had been elected the head of the Ukrainian General Military Committee (UHVK) at the First and Second Military Congresses, was appointed to this office. The UHVK had the following divisions: mobilization and military communications, military engineering, military schools, free Cossacks, sanitary-medical, special service commission, etc. In the summer and autumn of 1917, despite the obstructive policy of the Russian government, differences of opinion among the Rada’s leaders on ways to develop the military sector, and various incidents and provocations, Ukrainian regiments were enlarged, the ranks of “free Cossacks” increased to 60,000, and a state military command was being cautiously formed. On the initiative of military officers from Odesa, haidamaka kurins and kishes began springing up in June. In November, the Galician-Bukovynian Kurin headed by Yevhen Konovalets was formed from the nucleus of Galician Sich riflemen, who had been captured by the Russians. This military formation was responsible for protecting the Central Rada and its head Mykhailo Hrushevsky. 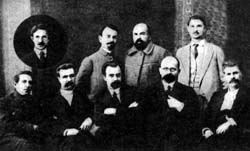 On Nov. 7(20), Hrushevsky, citing the resolution of the military congress, which he described as a “representative body of three million servicemen,” and expressing the will of the majority of the Ukrainian people, proclaimed the historic Third Universal, which was the first 20th-century document to restore Ukrainian statehood. These developments were facilitated by specific events that were taking place in the Russian Empire, including the overthrow of the Provisional Government. The Russian government opposed in all ways the self-determination efforts of the Ukrainian nation and even issued an order to institute criminal proceedings against the General Secretariat “for separatism” and to prepare cells in the Petrograd prison for the Ukrainian leaders. Whether some people today like it or not, the Bolsheviks overthrew this self-constituted Russian government in late October — early November 1917, thereby creating favorable conditions for the restoration of the Ukrainian state. This also permitted the Central Rada, which neither recognized the Council of People’s Commissars (Sovnarkom) headed by Lenin, nor opposed it, to declare the absence of a central government in the Russian Republic and, consequently, the end of its existence. Therefore, the Universal’s thesis about “not separating from the Russian Republic” had no practical value and was a tactical and propagandistic maneuver. Furthermore, the Universal declared the need to create a union (rather than a single state or a federation) of equal and free — in all senses-nations of the former empire. On April 29, 1918, faced with the immediate threat of a coup d’etat, the Central Rada adopted the Statute of the State Order, Rights, and Freedoms of the Ukrainian National Republic-the Constitution of the new Ukrainian state. It proclaimed Ukraine a sovereign democratic parliamentary republic in which extensive citizens’ rights and liberties were guaranteed. The supreme authority in the republic would rest with the National Assembly as the highest legislative body and the Council of National Ministers as the top executive body. The head of the National Assembly would “in the name of the republic perform all functions connected with the representation of the republic.” This document differed from the constitutions of Western states in that it envisaged a supreme single-chamber body of state administration-the National Assembly. The constitution did not envisage a presidential post. The hetman’s coup prevented this constitution and other laws from entering into force. Nevertheless, these historical acts exemplify the courage and consistency in Ukrainizing state bodies and defending the rights of the Ukrainian nation. Their contents should be useful in the legislative activity and development of the contemporary independent Ukrainian state. Out of the 19 parties active in the Central Rada, 17 advocated socialist ideas. But they viewed it differently from the way it came to be later, particularly in the 1920s-1940s. They viewed the socialist system as a condition of genuine people’s rule in which the independence of the Ukrainian state, the national revival, human rights, and the well-being of the people and their high cultural level would be secured. “As a democrat and socialist, all my life...I have defended national rights and not only those of my own nation,” said Hrushevsky, clearly stating his position. The Central Rada brought together romantically-minded but persistent and goal-oriented people. It should be noted that for a long time the members of the Rada did not receive fixed salaries. As of Nov. 25, 1917, they began receiving compensation in the form of a kind of per diem for the days they had spent working in the Central Rada — and there was no corruption. It would be worthwhile to establish a day commemorating the restoration of Ukrainian statehood on Nov. 20, the day when the Third Universal was proclaimed in 1917.